Jessica and John’s love for travel inspired their outdoor Sarasota wedding. 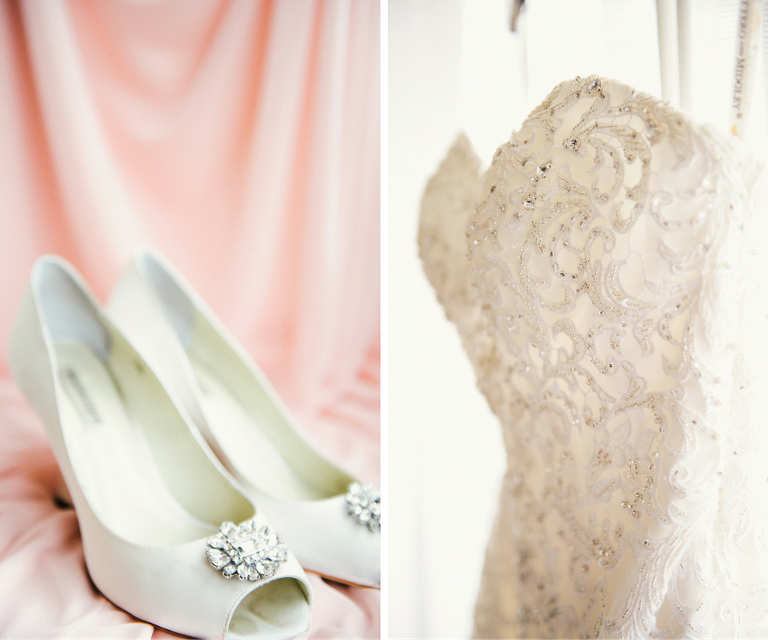 To complement their European inspired wedding venue, the Sarasota bride and groom chose a soft color palette. 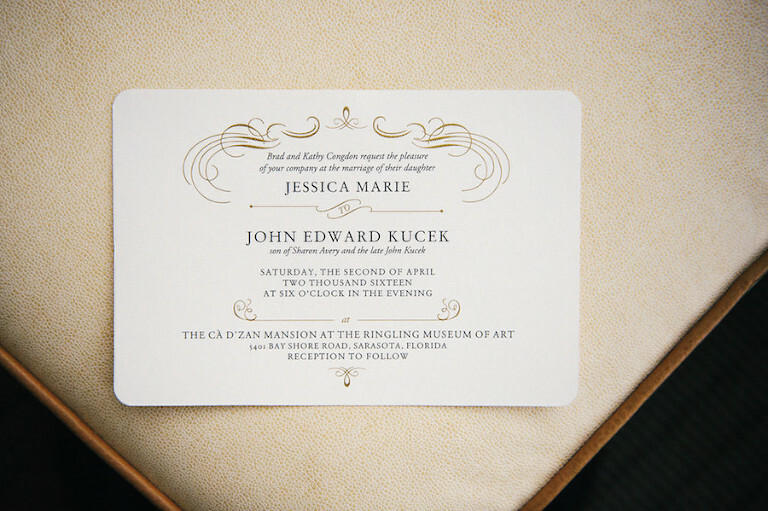 “The colors and Italian design elements set the overall tone for our wedding as one of elegance,” Jessica stated. 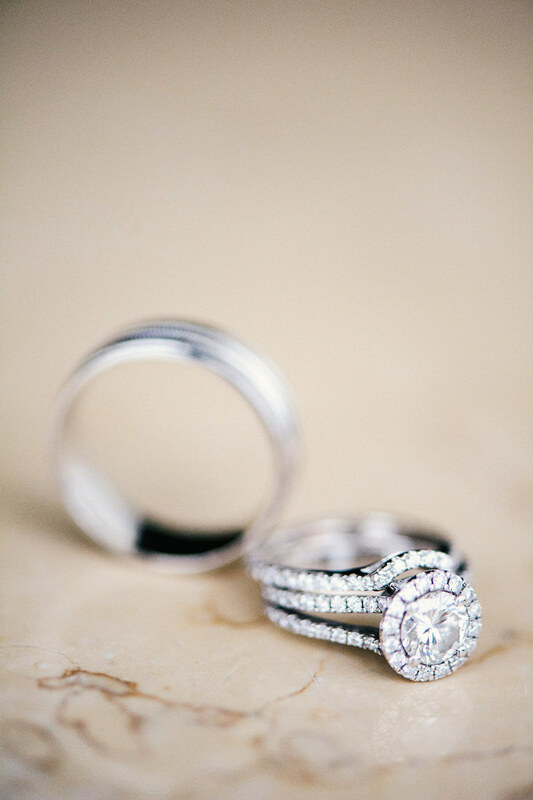 “I wanted a romantic, elegant and classic feel to match the venue. I wanted to keep the color scheme close to the colors of the Ca’ d’Zan: soft blush pinks and whites with touches of gold. 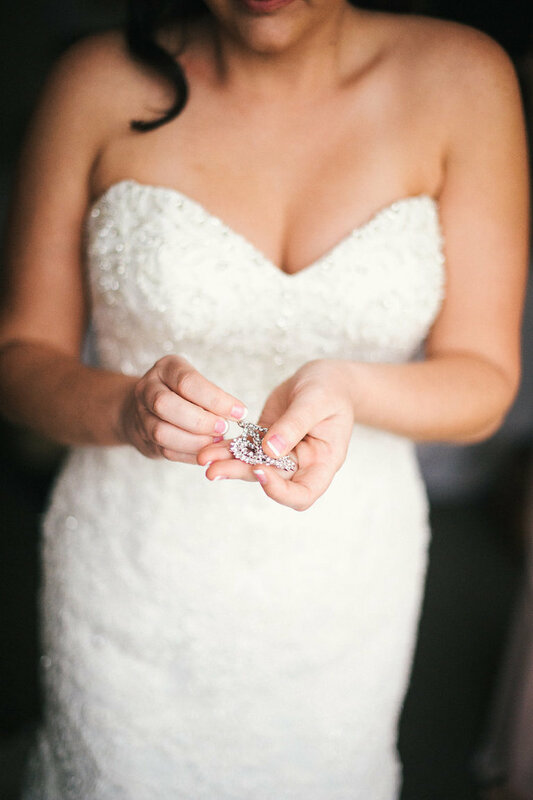 Since the couple lived in Tampa, they decided to hire an experienced Sarasota wedding planner. To provide their guests with a memorable experience and to capture a special moment from their wedding day, the bride and groom hired a live artist for the reception. John proposed on Key Biscayne in Miami. We were staying at the Ritz Carlton for a special surprise weekend getaway, and he proposed while we were walking on the hotel’s private beach overlooking the ocean. We took a walk to watch the sunset and that’s when he got down on one knee and popped the question. Following the proposal, there was a hotel server with a bottle of champagne waiting for us. While I wouldn’t say our wedding had a specific theme, I was very particular with the colors. I wanted a romantic, elegant and classic feel to match the venue. I wanted to keep the color scheme close to the colors of the Ca’ d’Zan: soft blush pinks and whites with touches of gold. The colors and Italian design elements set the overall tone for our wedding as one of elegance and understatement. We wanted a wedding planner who had been in the business for a really long time, who knew the area and had great relationships with local vendors. Since we are not very familiar with Sarasota, that was most important to us. I can’t give Nicole and the NK Productions team enough praise. They went above and beyond for us. They took a great deal of the stress away, helped with so many details and were very prompt with responding to all of my question. Sometimes I felt like they were planning the entire event with me, even though we only booked them for “day of” coordinating. Your wedding day will go by so fast. During the reception, take a moment and go for an intimate walk away from the guests, just the two of you. The day is all about you and your spouse, so it’s important not to forget that. Also, if you prepare yourself that some things do go wrong (something inevitably will), you’re more likely to realize how trivial it all seems compared to how fantastic the day was overall.